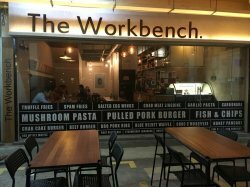 Located under a block of flats, in beween ang mo kio and bishan mrt is Workbench bistro. 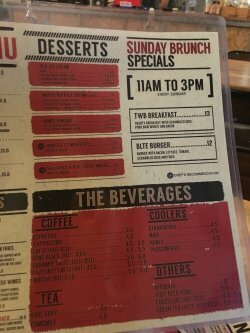 I last visited this cafe almost a year ago, when they have a small selection of food and was portrayed to be more of a waffles and ice cream hang out. 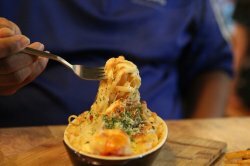 Their menu offering has doubled with more options to cater to various foodies. 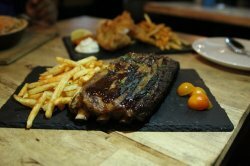 BBQ ribs, fish and chips, even salted egg wings. The dessert section with blue velvet waffle caught my eye and I asked the staff what is a blue velvet waffle and she said it was a waffle that was blue in colour! I knew I had to try it! I love spam fries and this was a pretty huge portion served with parmesan cheese and garlic mayo. The spam fries were sliced to the right thickness and was slightly crisp on the outside and soft and tasty on the inside. Eat them while they're hot. Once they've cooled, they become pretty hard and isn't as enjoyable. 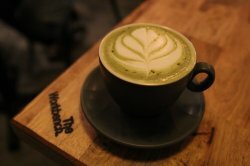 I liked the latte art on my matcha latte and it wasn't overly sweet. It has subtle bitternotes with each sip. I really enjoyed it. 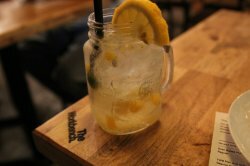 The temperature was just right and I slowly enjoyed this drink throughout my meal. Looked decent but it didn't taste up to standard. The pasta tasted bland and though they were generous with the prawns. I couldn't quite taste the cheese. 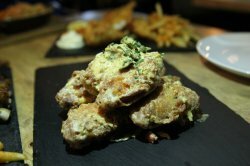 With the salted egg craze all over Singapore, I was still surprised to see salted egg wings here. Unlike a popular salted egg wing shop in timbre+, the wings here were very crispy and definitely exceeded my expectations. They were deep fried to perfection and then submerged in a golden sauce of goodness. The salted egg wasn't over powering or gerlat. Do share this with a couple of people too! I was abit stunned when I saw the portion of the ribs. Huge for $18, but once I grabbed my fork and knife and started to dig in, I was even more stunned when I felt the toughness of the meat. The meat was literally "glued" to the bones and it took some effort to get the meat off the bones. The meat was also dry in most areas. In the areas that the meat wasn't so dry, it was at least edible. The fries did way better than the ribs. I polished the fries off the plate! As mentioned in the BBQ ribs, the paprika fries were my favourite but the fish and chips here were pretty decent too. 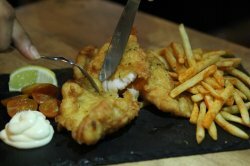 Crispy and crunchy beer batter was definitely the highlight of this dish. The fish meat tasted like your typical dory fish meat. But at $13, in a heartland area, I think this cafe still provides decent value to the table. 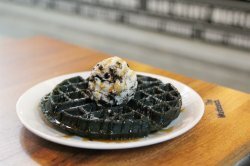 The blue velvet waffle was indeed blue, but a very dark blue. It gave me the impression that it was a charcoal waffle! Served with caramel sauce, the cookies and cream was okay. It was creamy but could've been smoother in texture. The waffle itself was very dense and cakey. I'm a crispy waffle lover so this wasn't the waffle for me. My friends however finished it off in minutes! Overall : This cafe does try hard to meet the cafe hopper experience. 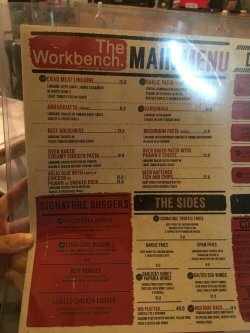 It has reasonably priced and for people living around the area, grabbing a weekend brunch would be ideal at workbench bistro. Nice, chill out ambience also helps you take your mind off the misses of some of the food here.